The application of spraying paints and coatings requires smooth, accurate, and pulse free flow to atomizers or spray nozzles. Reciprocating pumps, such as diaphragm or piston pumps, produce a flow that varies in both pressure and volume. In order to reduce material waste and improve product quality, precise amounts of fluid must be accurately metered to the application equipment. Color changes must be made quickly and effectively to prevent contamination and improve process productivity. Positive displacement gear pumps are becoming increasingly popular for spray painting applications. Zenith pumps provide superior performance for fluid metering, effective flushing, and long service life. Zenith pumps are precision ground and lapped to provide high volumetric efficiency and metering accuracy. The pump design produces virtually pulse-free flow. Special design features allow for quick and thorough flushing of all internal parts. 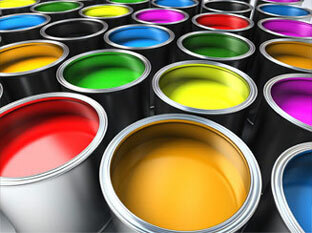 Several material options are available for different types of paints and application conditions. Depending on the materials used, pump wear can be significantly reduced when pumping abrasive fluids. Precise Consistent Flow - Zenith pumps used for paint spraying and coating applications provide precise, pulseless, and repeatable flow rates without complicated flow control devices and pulsation dampening equipment. High volumetric efficiency allows the pump to build and maintain the necessary pressure to move the fluid through a spray nozzle under varying process conditions. Accurate metering reduces costly waste and improves product quality by producing a uniform and consistent coating thickness. The Zenith active flow meter concept ensures accurate flow without expensive flow meters. Quick and Effective Cleaning - Special design features allow for quick and effective flushing which eliminates contamination between color changes. Dedicated paint booths and batch spraying techniques are not required. A single paint booth can be used to spray one or more colors, minimizing equipment costs. Extended Service Life - Many paints and coatings, whether water or solvent based, contain abrasive pigments which can reduce pump life. Zenith pumps offer several material options which improve wear resistance resulting in reduced repair and maintenance costs.